I'm doing a success story on a lady who came through my program back during the summer. She's worked for years at a national grocery store chain. A reorganization from corporate HQ mandated restructuring. All that looks good on paper, but pencil pushers rarely see the down and dirty results of those decisions. My candidate was one of those who got the letter. You've been an exceptional employee, but we're letting you go. Don't worry, you'll have access to COPRA insurance. Obviously, I'm making this part up, but I've worked in management and I can work out how it usually goes down. My candidate walked away, with a stack of awards and commendations for her years of work with the company. Before she came to my workshop, her inner voice had chided her into submission. I've actually heard those conversations myself. They tell you "You're worthless. Who's going to hire someone as "OLD” as you? You'll die broke" and so on. One of the main things I do with people who have been devastated by situations like this is to tell them how remarkable they are. And that they are worthy of finding a great situation. This lady attended every meeting we had. She took notes, and she did her homework. She landed a job a few weeks ago. When I talked to her today, she was a different person. She smiled. That made me happy. This evening when I got home, it was getting late in the day but I needed to walk to get my steps in. 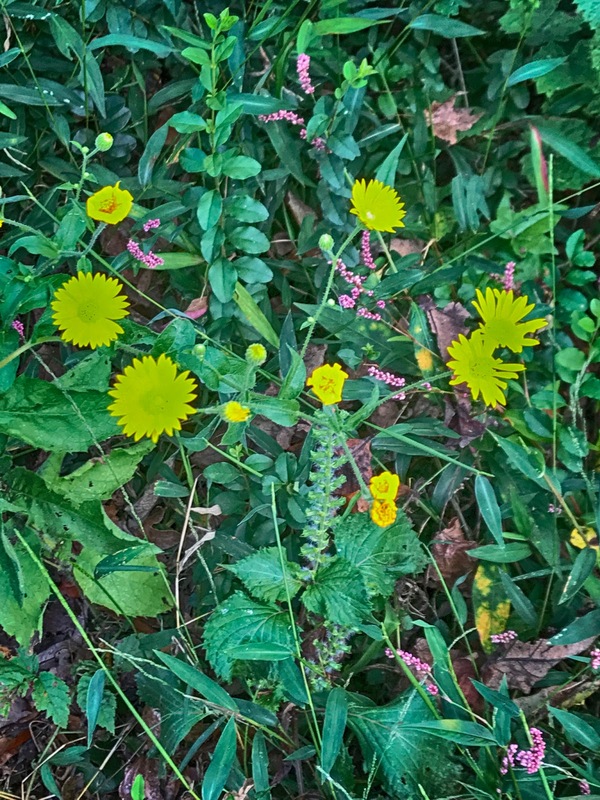 A few hundred yards down our path, I saw a patch of yellow flowers with some purple things mixed it. I didn't have time to research and identify what they were, but I did get a picture. The pinkish-purplish flower is smartweed. I usually leave some around the edge of the back yard just for the late summer/fall blooms. It must be very heart warming to the the fruit of your labor. 'tis good you know this. Probably many times you did not know the results of your work. A great success story. The power of positive think really paid off. I love this! It give me some hope. Ive been at a job now for 24years. I consider myself a good employee as I have never missed a day unless its owed vacation. Though I have never been given an award. Cant even get a raise. I see the business going down hill and worry im too old or too dumb to find anything else. All I know is what I do now. Those thoughts have been inbedded in my head from others. Bright spots lake that make a day all the better for sure. Our hopes and dreams are generally crushed under the weight of our responsibilities. I stayed at a job I hated for nearly 18 years (well, I didn't hate it the whole time). When my boss let me go, I was devastated, but happy ~ does that make sense? It took a little time, but I did find meaningful work that doesn't pay as much, but my stress levels are almost non-existent. I'm happier. But the distance between the unemployment to the employment of four months seemed to go on forever. If I had had access to your workshop, I would have been there. Great job in helping her move forward! Fortunately for me when I was laid off from my final job I was near retirement age. I was able to draw unemployment until my Social security began. Not many have the same good luck. Cruel unnecessary act. But, great that she could move onto another job. Love the spontaneous photo. I know I've said this before, but you're a good soul, Rick!! My tea roses have a different plant growing along with them. It has purple flowers. They're so pretty. I think it's important to mention that COBRA insurance can be very expensive. I couldn't keep my COBRA from the last job I had for very long because I couldn't afford it. Unfortunately, this lady's former employer sounds much like mine -- and other giant corporations' philosophies. I'll be happy if I can hang in there another 3-4 months.